Grove Music Online presents this multi-part series by Don Harrán, Artur Rubinstein Professor Emeritus of Musicology at the Hebrew University of Jerusalem, on the life of Jewish musician Salamone Rossi on the anniversary of his birth in 1570. Professor Harrán considers three major questions: Salamone Rossi as a Jew among Jews; Rossi as a Jew among Christians; and the conclusions to be drawn from both. 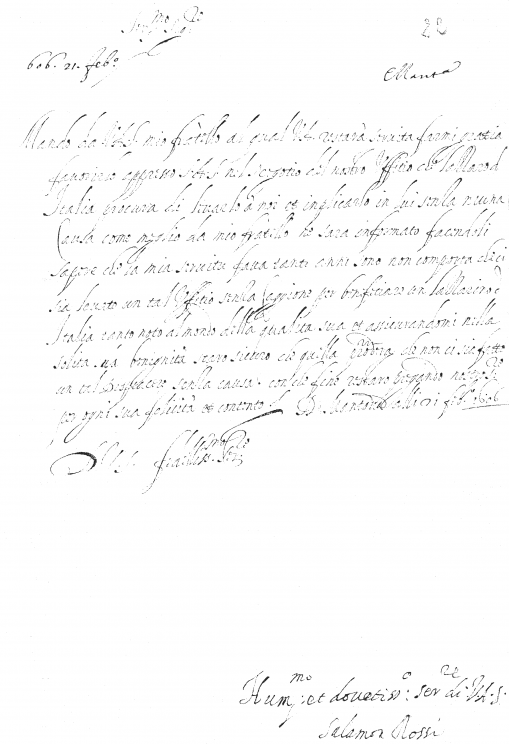 Letter that Salamone Rossi wrote on behalf of his brother Emanuele (21 February 1606); fair copy, with the close and signature in Rossi’s own hand. Archivio Storico, Archivio Storico, Mantua. Until now, it has been thought that Rossi earned his livelihood from his salary at the Mantuan court, and since the salary was—by comparison with that of other musicians at the court—very small, Rossi tried to supplement it by earning money on the side by investments. From 1622 on he was earning 1,200 lire, a large sum of money for a musician whose annual wages at the court were only 156 lire. Rossi needed the money to cover the cost of his publications and to support his family. Rossi’s situation within the community can only be conjectured. By “community,” we are talking about some 2,325 Jews living in the city of Mantua out of a total population of 50,000. True, Rossi was its most distinguished “musician” and his service for the court would have brought honor on the Jewish community. But because of his non-Jewish connections, he enjoyed privileges denied his coreligionists. In 1606, for example, he was exempted from wearing a badge. The badge was shameful to Jews who, in their activities, were in close touch with Christians, as were Rossi and other Jews who performed before them as musicians or actors or who engaged in loan banking. As other “privileged” Jews, Rossi occupied a difficult situation: his Christian employers considered him a Jew, yet the Jews probably considered him an outsider. He could choose from two alternatives: convert to Christianity to improve his situation with the Christians; or solidify his position within the Jewish community, which he probably did whenever he could by representing its interests before the authorities and by providing compositions for Jewish weddings, circumcisions, the inauguration of Torah scrolls, and for Purim festivities. All this is speculative, for we know nothing about these activities. We are better informed about Rossi’s role in the Jewish theater, whose actors were required to prepare each year one or two plays with musical intermedi. Since the Jews were expected to act, sing, and play instruments, their leading musician Salamone Rossi probably contributed to the theater by writing vocal and instrumental works, rehearsing them and, together with others, playing or even singing them. Salamone Rossi, Ha-shirim asher li-Shelomoh (“Songs by Solomon”), 1623, no. 8. See Salamone Rossi, Complete Works, ed. Don Harrán (Corpus Mensurabilis Musicae 100), vols. 1–12 (Neuhausen-Stuttgart: Hänssler-Verlag for the American Institute of Musicology), vols. 13a and 13b (Madison WI: American Institute of Musicology, 1995), 13b: 24–26. It was in his Hebrew collection, however, that Rossi demonstrated his connections with his people. His intentions were good: after having published collections of Italian vocal music and instrumental works, Rossi decided, around 1612, to write Hebrew songs. He describes these songs as “new songs [zemirot] that I devised through ‘counterpoint’ [seder].” True, attempts were made to introduce art music into the synagogue in the early seventeenth century. But none of these early works survive. Rossi’s thirty-three “Songs by Solomon” (Ha-shirim asher li-Shelomoh) are the first Hebrew polyphonic “songs” to be printed. Here is an example from the opening of the collection, “Elohim, hashivenu”. Good intentions are one thing; the status of art music in the synagogue is another. The prayer services made no accommodation for art music. Rossi’s aim, to quote him, was to write works “for thanking God and singing [le-zammer] to His exalted name on all sacred occasions” to be performed in prayer services, particularly on Sabbaths and festivals. Headline image credit: Opening of Salomone de Rossi’s Madrigaletti, Venice, 1628. Photo of Exhibit at the Diaspora Museum, Tel Aviv. Public domain via Wikimedia Commons. Don Harrán is Artur Rubinstein Professor Emeritus of Musicology at the Hebrew University of Jerusalem. His research topics include Jewish musicians and poets, as well as early Hebrew music historiography. He is the author of Salamone Rossi: Jewish Musician in Late Renaissance Mantua. 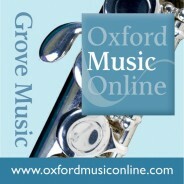 He is a contributor to Grove Music Online.